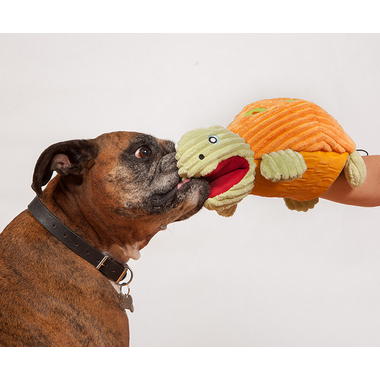 Hugglehounds' Kurt the Interactive Turtle is a puppet lined with latex and designed for hours of play with your dog. Featuring their super soft corduroy plush and lined with Tuffut Technology for added durability. When you put you hand in Kurt’s mouth he squeaks. The toy can also hold a old water bottle or be played with like any squeak toy. 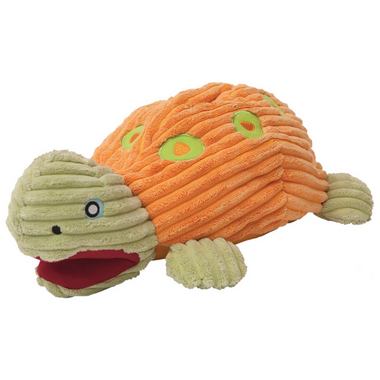 Kurt the Turtle is 16″ long. Tuffut Technology is a three step process that delivers the industry’s strongest soft toy. Extra protection while retaining light west and play appeal that is tested to withstand over 100 pounds of tugging and pulling and has no external seams that aggressive chewers easily open. Groundbreaking Tuffut Technology® makes HuggleHounds® dog toys the strongest and most durable plush dog toys produced. The top layer of HuggleHounds toys are designed for maximum appeal, with fresh colors and interesting textures and fun, original designs. Cushioning protection makes the toys easy to wash, and quick drying. Hugglehounds are also made with safety in mind. Toys have details embroidered on so that they’re not easily removed, and each toy is inspected before shipping to ensure the highest standards have been met.